A school health plan will identify the types of responsibilities, training and services required to keep your child's environment safe and how to respond to an emergency, should one arise. As a parent sending your child off to school for the first time, it is normal to experience a myriad of emotions. Although this can be a time of great anticipation and excitement, all parents have the usual concerns: Will my child like his new school? Will he like his teacher? Will he get on the right school bus? Will the program be one that allows him to grow and learn in a positive environment? As a parent of a child with food allergies, you have yet another dimension added to the anticipation and worries of sending a child off to school. In addition to all of the usual concerns, you will worry about his health needs and safety. What will he eat? How will he be able to participate safely in classroom and cafeteria activities? Will my child get sick at school? Will the school be able to respond promptly to an emergency? Does the school have a full time school nurse? Will the school arrange for my child to be given medicines or special asthma treatments during the school day? Concerns such as these are legitimate and understandable. You will have to "let go" of your child for the first time, and entrust your child's health to staff with whom you are unfamiliar. You will have to trust that the school staff will learn to manage your child's allergies safely, and learn how to respond to any emergency. How will you ensure that they do it? The key is to work with the school cooperatively and proactively to create a comprehensive school health care plan. A school health care plan will identify the types of responsibilities, training and services required to keep your child's environment safe and how to respond to an emergency, should one arise. 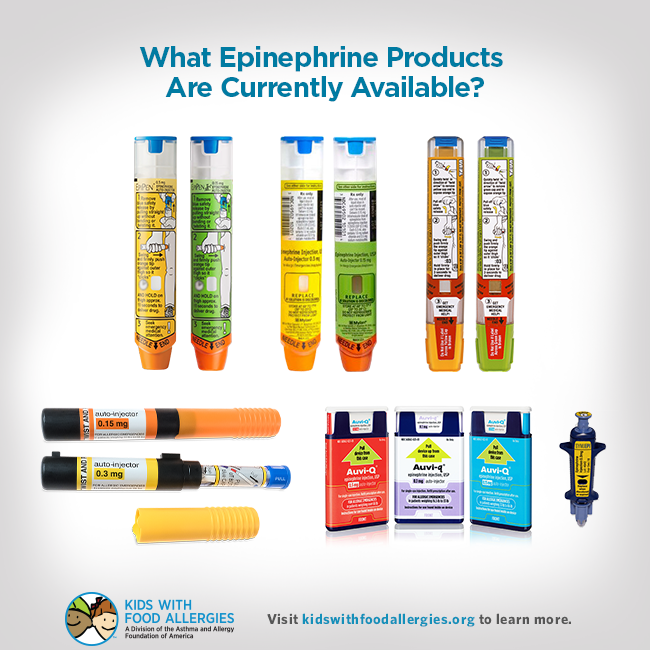 The three most common plans used for food allergic children are known as Emergency Care Plans (ECP), Individualized Healthcare Plans (IHCP) and 504 Plans. The best way to have the school begin to plan for your child is to notify the school principal in writing about your child's food allergies; and request a meeting to initiate a plan to ensure his safety and manage his health issues while at school. Some schools will require a letter from your child's physician detailing his or her food allergies and the special care and medications that will be required at school. Try to initiate this contact prior to the beginning of the school year so that a plan can be developed in time for the start of school. Use a positive attitude when approaching the school and consider yourself a part of the team that will work together to make sure your child is safe at school. The key is frequent, calm and confident communication. Doctors write medical orders for school nurses to follow. Emergency Care Plans (ECP) may be used to refer to a doctor’s order or as an additional form to supplement the doctor’s written medical orders. ECPs are written in terms understood by non-medical persons and should include a list of the allergens the student needs to avoid; a list of symptoms that require emergency treatment with an epinephrine auto-injector, instructions on calling 911 to transport student to the hospital; and a list of emergency contacts.1 The Food Allergy Emergency Care Plan by FARE is a commonly used form in the school setting for this purpose. The child’s physician or allergist must sign the ECP. An Individualized Health Care Plan (IHCP) (also sometimes referred to as an IHP) is a type of nursing care plan that fulfills both administrative and clinical purposes. For the food allergic child, an IHCP also contains an emergency care plan (see above) for managing and treating an allergic reaction, should one occur while the child is at school. In order for a student to obtain a 504 plan, the child first needs to be evaluated for eligibility by the school as meeting the definition of “disabled” Parents can request in writing that their child be evaluated for eligibility under the process defined by Section 504. To assist in the evaluation process the school will undertake, parents should be prepared to provide documentation from the child’s doctor to the school to support the assertion that the child’s food allergies cause a substantial limitation of a major life activity. While the purpose of a 504 plan is essentially the same as that of an IHCP, a 504 Plan is a legally binding document that offers procedural due process safeguards not afforded by traditional IHCPs, including due process hearings (with representation by legal counsel, if so desired) and parental notice and review requirements. Ultimately, if a parent continues to be dissatisfied with the plan as implemented by the school district, s/he can seek redress with the Office of Civil Rights (U.S. Department of Education), and beyond that, with the federal courts. All public schools are covered by Section 504. Private schools, including preschools, are also covered if their schools receives or has received some form of federal funding. Many, though not all, private schools do indeed receive federal monies. Other issues pertinent to your child and his specific food allergies, such as procedures to be followed on field trips, on the school bus, for school parties, and for other potential risk situations, etc. Determining which plan is right for your child depends on parent preference and also what federal or state disability laws, if any, are applicable to the school he or she attends, as to whether the severity of the child's food allergies qualifies as a "disability." A student does not need to have a disability (as defined by the Americans with Disabilities Amendments Act) (ADAAA) to receive an IHCP. However, a student must have an evaluation by the school that determines the child meets the ADAA definition of disability to be eligible for a 504 Plan. The format an IHCP or 504 Plan takes varies widely. In some schools, there might be a form or multiple forms, or a specified format. In others, there may be no pre-established forms or formats. You will have to ask your school to find out how IHCPs or 504 Plans are documented in order to work with the school to develop one for your child. No matter which plan you use for your child, make sure it is in writing. A written plan is essential for the school staff, as well as you and your child, to understand the roles each will play in ensuring your child's safety and care while at school. Make sure the plan addresses key issues that require attention in the classroom and elsewhere in the school. The plan must also include medication orders and an emergency treatment plan defined by your child's physician. A child with severe food allergies typically does not qualify for coverage under the IDEA unless the child needs special education in addition to accommodations and health services for his food allergies. Therefore, most children with severe food allergies will not qualify for an Interdisciplinary Education Plan (IEP), a type of educational program that is designed to meet a disabled child's unique needs, under the provisions of the IDEA, even though these children may indeed qualify for a 504 Plan. Schools often confuse the standards under IDEA with those of Section 504. To qualify for a 504 Plan, a student must have a disability that limits a major life activity and has nothing to do with a child’s ability to learn. Schools mistakenly deny food allergic students a 504 Plan because they conclude that the allergy does not affect the student’s ability to learn. Thus, it is important to understand the difference between IDEA and Section 504 so you can effectively advocate for your child’s needs in the school setting. The Americans with Disabilities Act (ADA), is another federal law that often offers protections to students with life-threatening food allergies. The ADA was amended in 2008 as the Americans with Disabilities Amendments Act (ADAAA). One of the most important differences between the ADAAA and Section 504 is that the ADAAA applies to most schools regardless of whether they receive federal funding. Specifically, Title II of the ADAAA applies to public schools and Title III to "places of public accommodation," which includes non-religious private schools and private daycare centers. Some states have passed their own disability laws that may provide for additional rights and protections beyond those spelled out by the federal laws. For more information, contact your state's Department of Education. As noted above, public schools must comply with the requirements of both Section 504 and the ADAAA. Many private schools are also covered by Section 504 by virtue of the fact that they receive federal funds. Moreover, all non-religious private schools must abide by the ADAAA. Should your school's principal not be willing to make the accommodations necessary for your child, you can contact your school district's Superintendent or school district's 504 Coordinator, in writing, to try to resolve the situation. Should that not be successful, you can then contact your state's Department of Education, which is responsible for enforcing compliance with Sections 504 and the IDEA. Violations of Section III (non-religious private schools and private daycare centers) of the ADAAA are handled by the Department of Justice (DOJ) Disability Rights Section. Violations of Section II (public schools and private schools receiving federal funds) of the ADA are overseen by the Department of Education's Office for Civil Rights (OCR). Remember to stay positive and focus on what your child needs to stay safe while at school. You may have to educate the school about its duty to make necessary changes to provide the accommodations and health services your child needs. Keep in mind that school planning is a process. The first year is the hardest because you are starting from scratch. Once you have a plan, you will need to modify and update it at the beginning of each school year or sooner if the need arises. Use the information in this article, and materials available to you from Kids With Food Allergies and other reliable resources to guide you in developing a plan for your child at school. The Position Statement on Anaphylaxis in Schools and Other Child-care Settings by the American Academy of Allergy, Asthma and Immunology is also very helpful and informative. Author Lynda Mitchell, MA, is the founder of Kids With Food Allergies (KFA), a division of the Asthma and Allergy Foundation of America (AAFA). KFA is dedicated to keeping children with food allergies safe and healthy by educating and supporting their families and the community. Lynda is the Vice President of Community Services for AAFA. Special acknowledgements to Laurel Francoeur, Esq. for reviewing this article in 2014. The original version of this article was written in 2007 in collaboration with Maria Laura Acebal, JD. 2. National Association of School Nurses. 2008. Position statement: Individualized Health Care Plans - The Role of the School Nurse. Revised January 2015. Accessed October 17, 2013 from http://www.nasn.org/Portals/0/positions/2015psihp.pdf. 3. National Association of School Nurses. 2011. Anaphylaxis Planning Algorithm. Accessed October 16, 2013 from http://www.nasn.org/toolsresources. Retired resource. 14. See for example, United States of America vs Smyrna Playschool, Department of Justice Complaint 202-14-46, revised 6 February 2001, accessed August 2007, http://www.usdoj.gov/crt/ada/cumberld.htm. Reviewed by Medical Advisors July 2014.